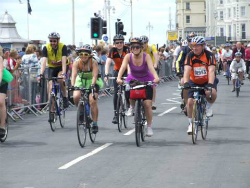 Charity bicycle rides are an awesome way to help those in need while doing something you love. You love to ride so why not ride for a reason? These rides are typically just that: rides. They are not races. They are meant to bring together the bicycling community to do something for the common good, while doing something that they do all the time anyway. All kinds of organizations sponsor rides to raise money to fight diseases like cancer, MLS, Parkinson’s, Arthritis, Leukemia, and many others. They all have a ride of some sort and most likely in, or near, your area. The rides cover a specified course, either an out and back or loop, and are designed to accommodate all kinds of riders, on all kinds of bicycles, within all ranges of abilities. Distances can range from 10 miles to hundreds over several days. Each charge a rather nominal entry fee and most provide food and drinks usually supplied by the sponsor. Let's face it guys. We are going to ride anyway so why not ride for a reason? You will have fun and the satisfaction of helping those less fortunate. Return from charity bicycle rides to home page.